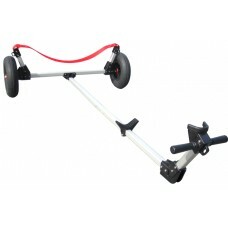 Dynamic Dollies and Racks brings the latest in design and materials to popular small boat dollies. If you have owned a Seitech Dolly in the past, these dollies are 100% interchangeable but have several notable improvements. New features include wheels with ball bearings, tie-down eyelets on key parts, injection-molded glass-reinforced plastic joints, and a 3" non-stretch polyester sling.